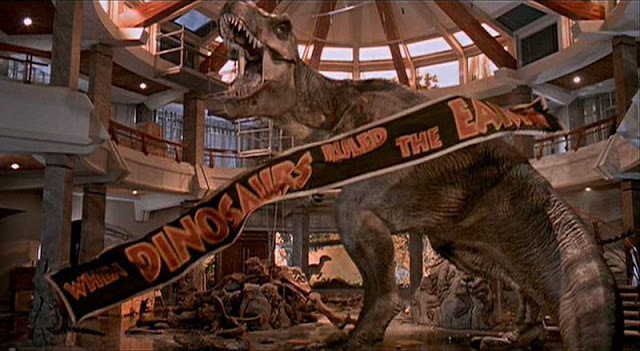 June 11, 1993...a film "65 million years in the making"...smashed, trampled & terrified us all the way to the top of the box office. It held the title of Biggest Film Ever until the story of a behemoth ship sinking took over the spot. Up to that point in the time of film making, we only knew stop-motion & go-motion mixed with puppets & merkets. Something very special happened in the hands of a director with an incredible vision, super thinking computers, a script full of science & scary truths, massive machines & dozens of workers. To this day, I am still tortured, tormented & all around terrified during deep sleep thanks to the extremely realistic Jurassic Park. 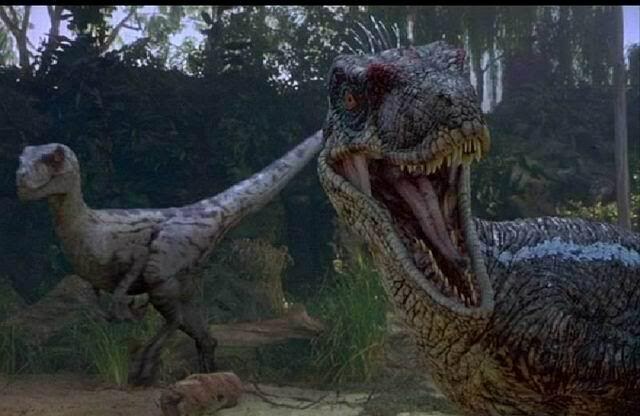 I remember being unimpressed with the thought of sitting through a movie filled with sad claymation...especially when it comes to dinosaurs since I've been a an enthusiast since I first gazed down at drawings of these massive creatures at age 4. I started hearing A LOT of big buzz about the movie & was not so against being taken to see it by 2 female friends. We ended up getting our tickets at the right time, well the right time to be taken to a line that wrapped around the building...TWICE! So we waited briefly as the next theater opened & the line started piling in to see the show. Unfortunately we didn't make that sitting BUT we were 5th in line for the next show. So we finally were let into the theater & I was dragged down to the 3rd row from the front & we sat in the center of the screen. Triceratops, thanks to Stan Winston & all his creative genius (he was the creator of the Alien Queen in Aliens as well! ), I truly & honestly felt that these creatures that were thought to be long since extinct...could actually be living amongst us!! I soooo wanted to jump up & put my arms around the sick Tric...& just be in the presence of such an astonishing beast! Of course, soon to be seen...a dinosaur that would haunt me forever! 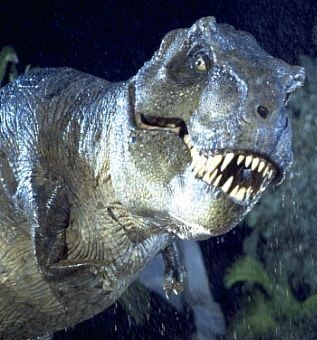 I can honestly say that I have never felt such terror in life as I did when the T-Rex came walking in front of the vehicles in the torrential down pour. The entire time she was on the screen, I was just beyond terrified! 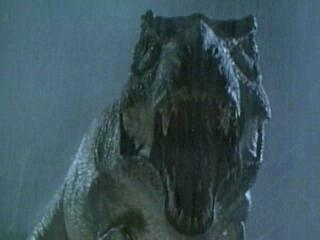 Then it happened....the T-Rex opened its mouth & let out a scream that truly chilled me strait to the bone! I was frozen stock-still & I swear to you...I peed myself....not really....well...maybe just a little. At the end of the scene, I remember the realization of where I was, what was going on & how I felt. I was squatting on my seat as one of my friends was clinging in behind me, apparently using me as a protective shield. My other friend was on the ground & holding onto my legs as she peered out between the edges of the seats, AND...the middle-aged father sitting next to me had my other hand pinned to the arm rest as he was squeezing it in fear. So even if I had wanted to run....I simply couldn't!! After the scene, he realized what he was doing & apologized to me, only to continually repeat the pinning of me to the arm rest with his superman grip. Of course there were A LOT of those times in the movie all the way up to the last gigantic bellow from the terrifying & surprising hero of the movie! 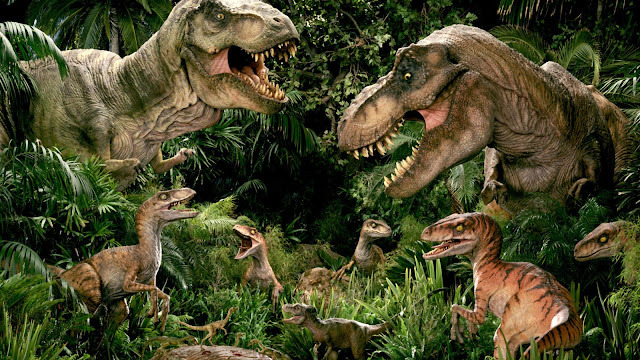 By the time the movie ended, not only was I a believer that dinosaurs could actually be genetically engineered & roaming the planet, but I also became terrified that they truly are walking amongst us RIGHT NOW! I swear I could see Raptors in the shadows & T-Rex moving through the trees with each blowing wind. I have had over a dozen dreams about dinosaurs & I'm usually running/hiding/escaping from them but they just keep on coming. I have very vivid dreams in which I can see color, feel cold, smell food & even feel pain...so these dreams are very realistic & very terrifying! Even though it's been 20 years & I must have seen the movie truly hundreds of times, I'm still both in love with & terrified by dinosaurs. So what do I go & do...see it in IMAX 3D where my honey & I sat in row 3 front & center!! I still was frozen stone-cold when T-Rex called out directly at us! I still came outta my seat when the Raptor jumped up after Lexi's leg! I still sat with tears streaming down my cheeks as I first witnessed a sick Tric! I cracked up laughing in all of those "juice" moments that provided laughter after terror & held my breath in anticipation of what might be coming! 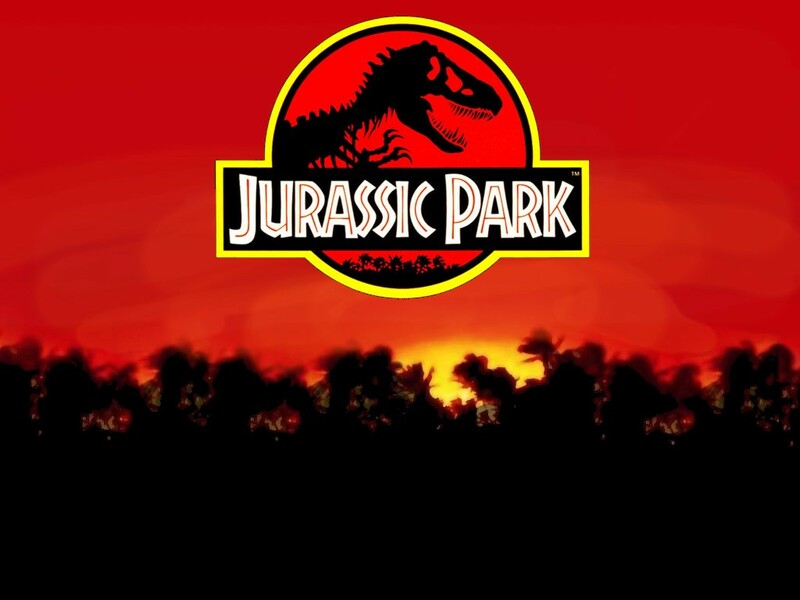 I am such a huge lover of the Jurassic Park series, that I alone account for at least 15% of it's total gross earnings. I dragged everyone I knew to the theaters to see each of the movies! If you hadn't seen it, you'd be sure to know that you soon would be! I have gone both alone & in large groups. To this day...there is nothing more terrifying to me then looking up at huge meat-eating machines with chompers packed full of teeth! Basically the land version of Jaws. 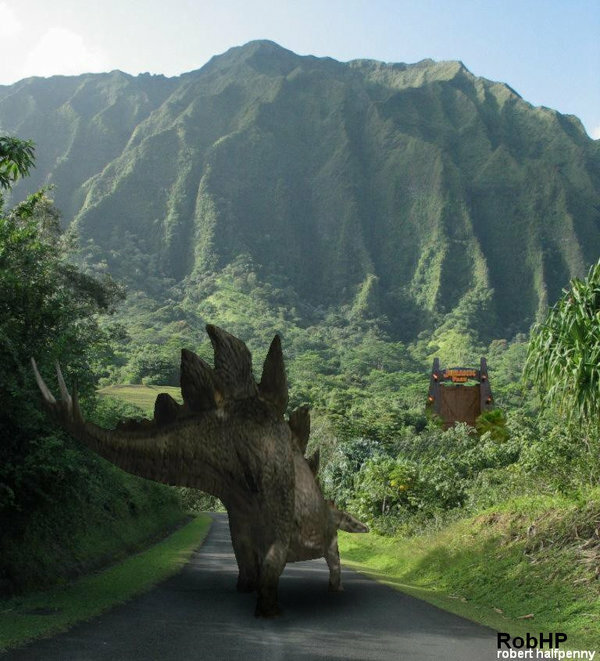 My personal favorite dino is the Stegosaurus. After reading the book, I was disappointed that it was replaced with the Tric for the part of the sick dino in the movie. I was then THRILLED that it showed up large in the second film. I even have my own little stuffed Stegosaurus that my cat used to drag around the condo while meowing about it. I also became such a fan of dinosaurs that I have sought out my own fossil piece & have several dinosaur books. Now there is a Jurassic Park IV--Extinction coming in June, 2014! Well...you know I'll be there opening weekend, sitting front & center in that 3rd row! Although I seriously doubt I'll be having any popcorn! 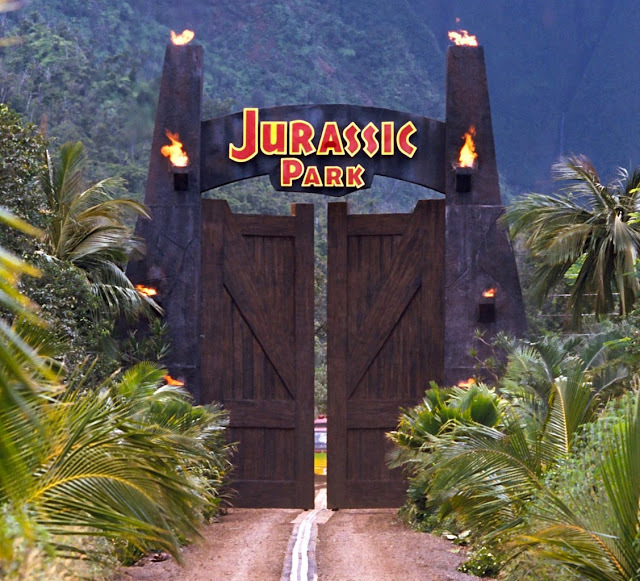 Long Live The Terrifying Gift of Jurassic Park!! !